Please look at our curriculum letter to see what the children will be working on this term. If anyone has resources or things they could share with the class, please don't hesitate to get in touch with a member of staff. This week has seen lots of excitement! 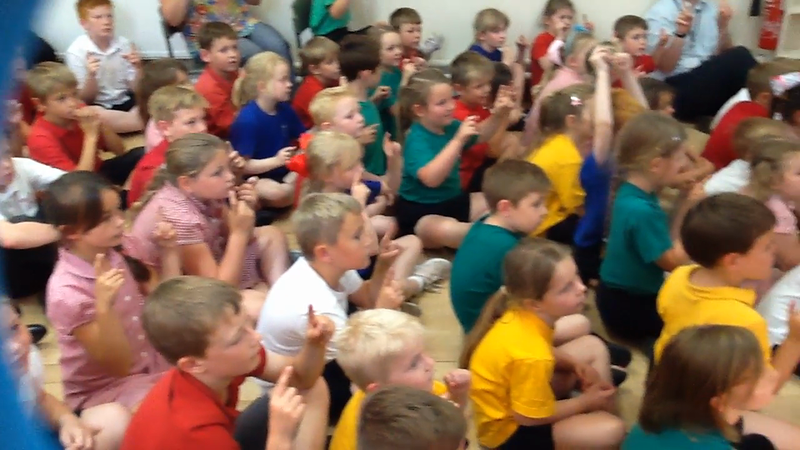 The year 3s performed to the whole school and parents on Wednesday afternoon- they were brilliant! So much hard work has been involved. There is one video clip (see below) for you to get a taste of their performance. Unfortunately the website only allows very short clips to be uploaded so quite a few other pieces can't be seen. Perhaps even more exciting though was the hatching of the first chick again on Wednesday afternoon- see the photos below. At the moment we have 1 hatched out and another almost there. So watch this space! In class, we came up with a menu of what the Iron Man might want to eat and we wrote in character. In Maths, we've done a lot of practical work on measures, especially converting metres to cm and vice versa. The children have coped very well with the heat although they are beginning to get tired- roll on the holidays! The chicks began to hatch! This week we've done lots of work around The Iron Man- there are some pictures showing our drama work. The children became the seagulls who had spotted the iron man's body parts on the beach and then watched as he reassembled himself. In Maths, we completed our last Arithmetic paper of the year and all the children did well. On Friday, Y3 went outside to put lots of learning objectives together- they drew polygons, measured them and found their perimeters using column addition. Meanwhile Y4 did work on coordinates and produced some super pictures. Acting out "The Iron Man"- the gulls and their chicks. This week, around day 7 of us having the eggs, Vicky came in to check if there were chicks developing inside. Unfortunately, 7 had nothing inside so she took them out of the incubator. We have 9 definites and 6 possibles so fingers crossed! We took pictures of how she checked them- please see below. You might be able to make out a black dot /circle near the top of the gg in the right hand picture. Vicky says this is a chick's eye! We'll keep you updated. In class we wrote our hot task character description using the model of The Iron Man. The children did very well and their work will be put up on "Our Work" wall in class so feel free to come in to read some. In Maths we worked on Time- telling the time, matching analogue and digital times and solving time problems. The children really enjoyed the practical/ game activities we did on Wednesday. Thursday afternoon was a super afternoon of Sport- there should be pictures appearing in the Gallery section soon. The children loved Sports Day and all participated well. Checking the eggs for chicks! So many things have happened this week! "Visitors" arrived on Wednesday- see attached picture. The children were very excited and hopefully in about 3 weeks time we'll have some chicks in class. On Thursday afternoon the y3/4s took part in a skipping workshop which was great fun. The play leaders will be coming back in about a month's time to do a progress check to see if the children have improved so keep skipping! There are a few pictures in the Gallery section, please have a look. Meanwhile in Literacy we started work on character descriptions. We are working on Ted Hughes' The Iron Man. Ask your child if they can remember how big his head is and what it is shaped like. Please see the photos for a hint! In Maths we've worked on 2d shapes, 3d shapes and Time this week. How big is Iron Man's head? Day 1 of our "visitors"
This week has flown by- we've visited Harrogate Countryside Days Event on Tuesday (please see pictures in our Gallery section of the website) and we've completed final assessments for Reading and Maths. The children have worked extremely hard and I'm very proud of them. We've also been lucky enough to have some children participate in sports competitions/ festivals. They looked really smart in their new school kit!. In Literacy, we wrote a "ColdTask" piece describing a character- I really enjoyed reading about Pippy Longstocking and Jack Sparrow. Next week we start our Talk for Writing work again. What a busy week- finishing off Science work on plants, completing our Literacy work on The Night Gardener by writing a sequel and also working on solving word problems in Maths. The children had a brilliant day on Friday doing Team activities in their House Teams despite the weather! Please look at the Gallery for some photos of the activities. conscience alley- should "William" follow the stranger? This week's vocabulary : transpiration ! This week in Literacy we wrote as a character from our book " The Night Gardener". We did some drama work first to help us empathise with the character. Please have a look at our photos. In Maths, we did some more work on finding the perimeter of shapes and the Year 4s began to find the area of squares, rectangles and compound shapes. Our Science experiments seem to be following our predictions but the one where we used celery and food colouring in water hasn't quite gone to plan so far- watch this space! This week we did a lot of drama work around The Night Gardener. Do look at the photos for our brilliant actors! We also revisited how to punctuate speech accurately and how to use noun phrases in our writing. In Maths, we worked on multiplication and division using formal methods of recording. The children are getting really good at this- practise does make perfect! In Geography, we worked on finding where the major cities of England are located on a map. The Night Gardener- we ADMIRED his work. Another very busy week! In Maths, we've been comparing and ordering fractions and decimals and counting up/ down in tenths. The tricky part is changing to the next whole number instead of saying ten tenths! We continued our work on the Night Gardener and used what we know to write some sentences with noun phrases. Ask your child if they can remember what a noun phrase is. On Friday, we also introduced a new activity- shared reading- which the children seemed to really enjoy. Hopefully, they will remember what they had to do. We also set up more experiments in Science, hoping to prove that plants need water and light to grow well. The children came up with great ideas - so 1 plant is now in our stock cupboard! This week the children continued to work on the Night Gardener in Literacy. We completed reading the story and did some drama work around the characters of William and the Night Gardener. In Maths, we did lots of work on mental addition and subtraction , building up to written methods towards the end of the week. The children also worked on the main compass points; the capital cites of the countries which make up the UK;and we tried to name some of the bodies of water around our island. This probably needs a bit more work! Ask your child if they can remember what these words mean and if they can remember any synonyms. Mr Palmer particularly liked kerfuffle! This week, the children soon got back into the swing of things. We started work on a new text, "The Night Gardener" , which will link closely to our Science work this half term. In Maths we revisited place value and did lots of work on ordering and comparing 4 and 5 digit numbers. We also worked on how to read and write numbers both as words and as digits/figures. We did some work on negative numbers too -lots of children said they'd never heard of them before so hopefully they know what they are now! We have a Dance teacher coming into school on a Wed afternoon to do work with the children. By all accounts, the children really enjoyed their session. 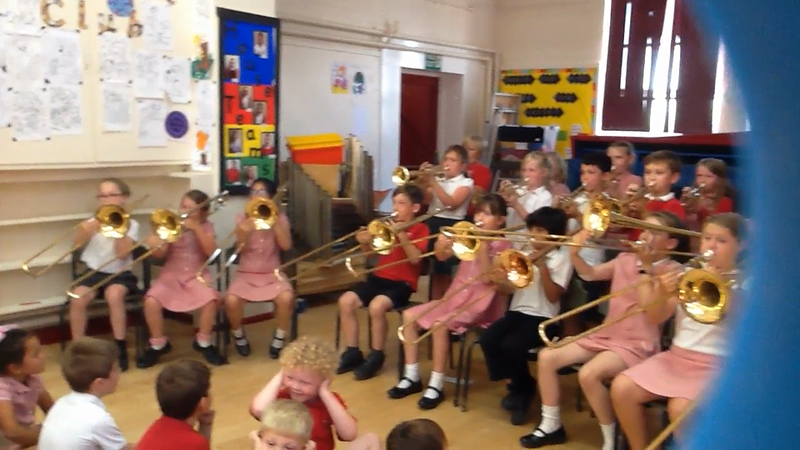 We also have the chance for the y3s to perform some of the pieces they've learnt in their brass music sessions so watch this space for more details. HAPPY EASTER! LOOK AT OUR FANTASTIC DECORATED EGGS. 1, 657,370 steps! What a fantastic achievement! We have been doing some assessments this week in Reading and Maths so as part of a reward for working so hard, we had a visit from 2 scientists on Thursday afternoon who work for Croda. Our class carried out an investigation to discover which substance would mix oil and water the best. Our results were quite conclusive- most groups found the same product was the best "mixer". The children enjoyed the measuring, shaking and taking on different roles such as Communications Officer, Health and Safety Manager or Resource Manager. The important part was working together as a team. After this fantastic Science, we had a surprise visit from Jacob, Pippa's pet goat! The children loved this and asked lots of interesting questions. Please look at the photos for a record of a brilliant afternoon. This week, we've added lots of pictures to the class page. We carried out a Science investigation on Monday where we asked the question "Can people with longer legs jump further than people with shorter legs?" We had to measure the length of the femur bone and then plan how to carry out a fair test. Our results confirmed the prediction of most of the class- it doesn't matter how long your legs are! At the end of the week, we took time to handle, use and sketch artefacts from Ancient Greece. The children learned a lot from this activity as well as enjoying trying the sword and helmet. As usual, we also worked hard in Literacy and Maths- solving problems where we had to work out change from £5, £10 and even £50. In Literacy, we wrote our own playscripts and then began work on writing a set of instructions. Can people with longer legs jump further than people with shorter legs? Our first week back after the half term holiday and the children soon settled into their work. We began looking at Playscripts in Literacy. A few of our Guided Reading groups are currently reading plays and as a class we read and acted out scenes from Hercules Superhero. We discussed what we liked and disliked about it and we also came up with some things that puzzled us about the story- for example, how could Atlas hold up the world if he was in the world! In Maths, we did a lot of work on finding the perimeter of shapes. We also spent time finding the perimeter of objects in the classroom and out on the playground. It took a long time to measure the actual Playground! Ask your child what they measured and if they can remember what the perimeter was. What a fantastic day we had in Doncaster! First, we visited the Museum to do a workshop on Ancient Greece. The children rotated around 5 different activities looking at things such as armour, Olympics and sport, Theatre, geometric shapes and daily life. We learned lots of new things. All of the children (and the staff) also had chance to dress up in Ancient Greek clothes. Mrs Wright did so very reluctantly only after a democratic vote- following another Greek innovation- Democracy. At the end of the session, we looked quickly at medicines in Ancient Greek times and discovered possible remedies for sleeplessness, tummy ache and even flatulence! After lunch, we walked to the Sikh Gurdwara where Mr Singh showed us around and told us lots of interesting things about the Sikh religion and way of life. We had to cover our heads as a mark of respect and take off our shoes when we entered. We learned that there have been 10 Gurus in human form, 1 of whom was just a boy of about 8 years old. We also found out that the Sikh holy book is regarded as the 11th Guru and sits on a throne, is fanned and even is "put to bed" at night. We visited the Gurdwara kitchens to see where Langar is prepared- this is the custom of sharing food at the end of the service. Mr Singh gave us all some Langar to eat and drink on the way home. We learned about the 5 articles of faith- 5 things that Sikhs wear or carry as a mark of their faith and to remind them of their god. All Sikhs have uncut hair; males carry a knife for protection: they use a wooden comb to keep their hair tidy; baggy trousers/shorts are worn so bathing is possible; bracelets are worn on the wrist as a reminder of god. I think the children had an amazing experience they will not forget and I am so proud of the way they behaved! This week we continued our work on fractions in Maths. The children looked at finding equivalent fractions and how to label fractions on a line. We did find this quite tricky but we'll visit it again later on in the term. In Literacy, we worked together to do a shared piece on Perseus and Medusa. The children came up with fabulous ideas and I've put a copy of this shared worked on our page so do look at it. I'm sure you'll be impressed! What great actors we have in this class! Our drama work for Literacy this week would put some professionals to shame- have a look at the pictures below and I'm sure you'll agree. In Maths, we revisited fractions and worked on finding non-units fractions of amounts eg 3/4 of 16. Year 4s worked on the same but with multiples of 10. This week in Literacy we completed learning our myth, Theseus and the Minotaur. We did some work using a thesaurus to find alternatives for adjectives and we worked on how to start a myth in different ways. The children enjoyed doing lots of activities on Friday, especially using the (very little) evidence we had to build up a picture of both Theseus' personality and appearance. In Maths, we revisited the 4 operations using formal methods to solve them and we also began to look at solving word problems. Most children find word problems tricky so we'll keep working at this later on in the term. Happy New Year! This week the children came back refreshed and eager to learn new things. In Literacy, we started work on Greek myths and in particular Theseus and the Minotaur. We've begun to learn the story and had a good discussion about what the message is so far in this myth. In Maths, we worked on divisions with remainders and then used this new knowledge to solve divisions using the bus stop (or "Short" Division for those of us of a certain age !) . All the children worked really hard at this . We began our topic work on Ancient Greece by finding out what the children already know. Ready for the final performance of "It's Christmas!" The weeks are flying by! 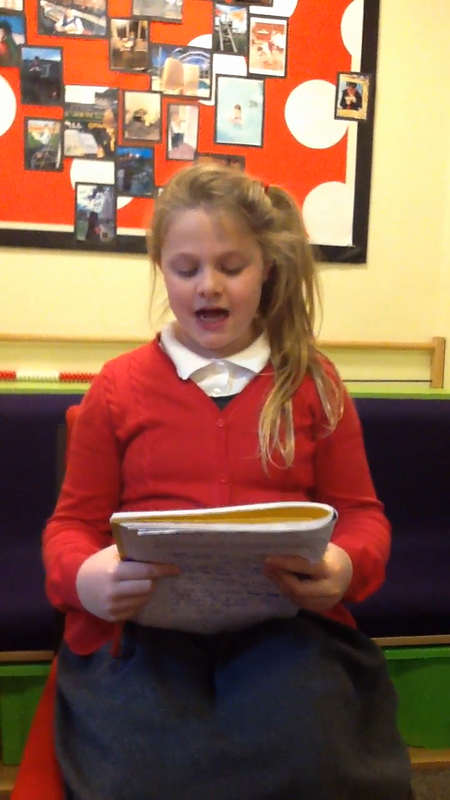 This we've done a few practices of the KS2 production and I'm sure you'll love it! As well as that, we've continued our work on Moon Man and I have been able to put some news reports on the website on our class page- not all unfortunately as there isn't enough file space- so please do have a look. 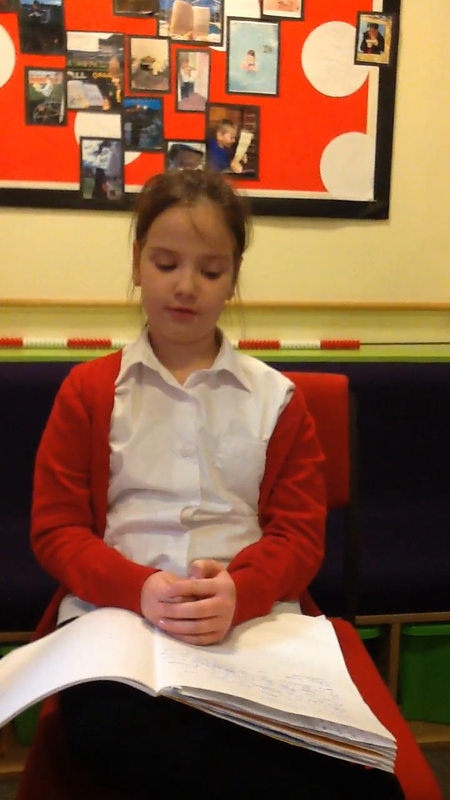 On Friday Ann-Marie became Moon Man and had to listen to her "conscience"- Did she make the right decision in leaving the moon? (She is now in jail!) The children came up with super ideas for and against and we will use these next week in our writing. In maths, we finished our work for the moment on fractions and completed our second arithmetic test in which the children all improved from last time so a big well done to them. This week we continued to work on fractions, finding fractions of amounts and comparing fractions. The Year 4s also began to find equivalent fractions. Ask your child if they can remember how to find 1/4 of 16! 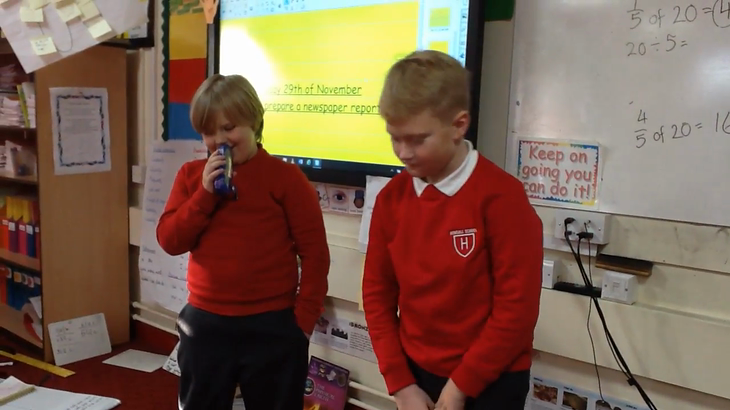 In Literacy, we did lots of drama work and if the BBC are ever in need of news readers, I think they could recruit from our class as we have some fantastic budding journalists. I am trying to upload some of the videos onto the website so watch this space! We used drama in Literacy to explore a character's actions and feelings. The children chose a character from our text, Moon Man, and reenacted the scene where Moon Man has crashed and lots of people rush to see what has happened, including an ice cream man! This week we completed our assessments by doing a Maths test. The children worked very hard - everyone tried their best so well done! In literacy we continued our work on Moon Man and used drama to help us explore how a character was feeling at certain points in the story- see some photos below. We also worked together to write a group description about the moon. In Maths we started work on fractions- we found fractions of shapes and of amounts. Ask your child if they can remember what the top and bottom numbers of a fraction are called. Do look at our Science photos too- when the sun finally came out on Thursday we took our chance! 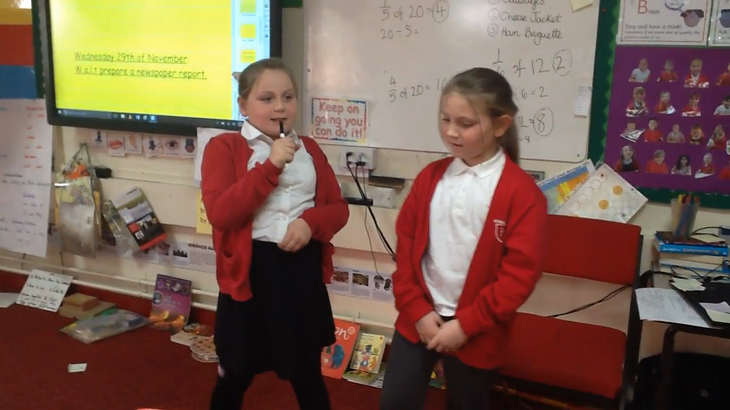 Lowri was brilliant as Moon Man and the rest of the class came up with some fantastic questions- how did she feel when she grabbed the end of the star? Did she get cramp when she was all squashed up in the moon? What does she want to do most of all? How old is she? Moon Man comes to visit Greece class. Shadows in Science- we took the chance when the sun came out briefly this week to look at how shadows made by sunlight change over time. We chalked around our shadows first thing in the morning and then checked them at lunchtime by standing in the same position- Our shadows had moved towards the right and were a lot smaller! What another quick week! In Literacy we looked carefully at pictures of the moon and annotated sketches using adjectives and similes. Ask your child if they can remember what simile they used. My favourite one was Charlie's- he said it was like a great eyeball in the sky! In Maths, we completed our work on Time- we will revisit this area as it is tricky for most children but we made progress converting analogue to digital times. We finished with clock bingo, time dominoes and time pairs. In Topic, we discovered what Stone Age people ate and the children prepared a fruit stew with Mrs Hiorns which most of us tried and liked the next day. see our fabulous pictures. The finished product! It tasted good. This week the children completed their hot task on report writing/ information text writing. Their reports were on all sorts of things- elephants, people, the Titanic and even Disneyland. We started work on a book called Moon Man and had a great discussion about the illustration- what we liked, disliked, if there was anything puzzling or if there were any connections to be made. In Maths, we worked really hard on time- telling the time, converting time to digital,etc . Lots of children find this concept tricky so if you can reinforce what we've been doing by pointing out clocks and asking them questions, that would be a great help. In Science, we started a new unit on Light and Shadow- let's hope for some sunny weather so we can look at our shadows and why they are different lengths sometimes. What a quick week! On Monday and Tuesday most of the class were at Kingswood where we had a fabulous time. Photos should appear in the Gallery section of the website soon! Back in school for the rest of the week and we completed our Talk for Writing text on Volcanoes.- ask your child if they know what is a good way to start a report or information text. In Maths we worked on doubling and halving even numbers using partitioning. Congratulations to Nicholas who received word this week his story will be published in a book later this year- I can't wait to read it ! The children have had a fantastic week. They've worked so hard- we completed our work on narrative by working on punctuating speech accurately and on Friday, the children wrote their hot task pieces. They're brilliant! In Maths, we did more work on the four operations, focusing on multiplication- the children are beginning to realise how important it is that they learn and practise their times tables. On Thursday afternoon, we erupted our volcanoes out in the playground- it was very exciting! Please have a look at the pictures. This week, the children have been working very hard on lots of different areas. In Literacy, we leaned when to use a new paragraph in our writing and turned some nursery rhymes into great stories. Please feel free to look at them on Our Work wall in class. We introduced column subtraction to the year 3s and revised the same thing, but with bigger numbers, with the year 4s. Our Science work continued with fossil making and a discussion about how fossils are formed. Our volcanoes are almost ready to paint and therefore to erupt ! Pictures to follow of course. All of the children have been given a copy of their Mathletics login details- please encourage them to try it out at home and to spend 10 minutes or so playing / practising the activities. First of all, huge congratulations to our new School Council representatives- Maisie-Grace, Samuel and Zara. 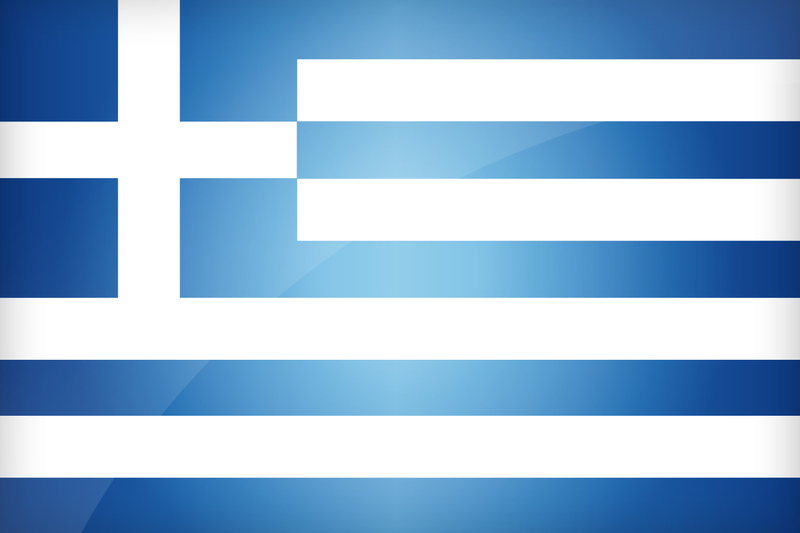 I'm sure they'll do Greece proud. This week in Literacy, we completed learning our text- Cave Baby- and we began to look carefully at the sections of text which make up the paragraphs. We drew some fabulous pictures of Cave Baby's paintings at home, in the mammoths' cave and what he dreamed about once he was safely home. In Maths, the Year 4s worked with big numbers revising column addition while the year 3s were introduced to the column addition method- they were all brilliant! Ask your child if they can remember our success criteria! House Team Day took place on Wednesday and we all had a great time- please see the photos which should appear in the Gallery soon. 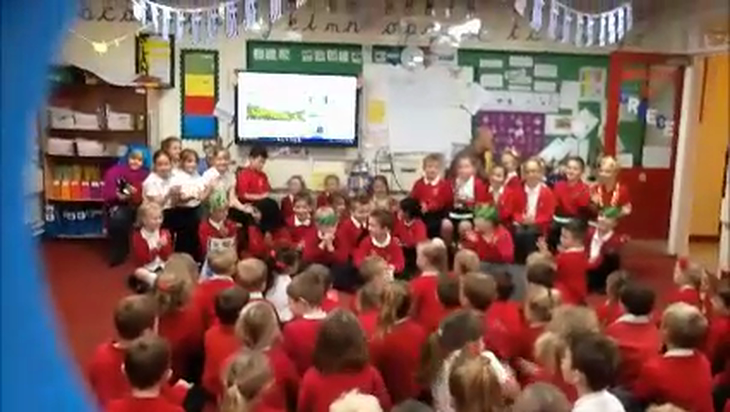 The children performed their class assembly to KS1 and some of KS2 on Thursday - they were brilliant as I'm sure you'll agree when you look at the video. Unfortunately, the ending of the assembly does seem to have been cut off so apologies for that! In lessons, we have been working on counting on and back from any number in 10s, 100s and 1000s- we ended up with some very, very large numbers. Our Talk for Writing continues but we've also had time to learn more about fronted adverbials, subordinate clauses and punctuation. Please ask your child if they can remember any of the work. What a fantastic week we've had. We started on Monday by going on a rock trail and comparing the appearance and purpose of different types of Rocks. Later on in the week, we continued our work on the Stone Age and made a class cave painting of our handprints. We also designed our individual cave paintings. Meanwhile we worked on our Talk for Writing text in Literacy- Cave Baby. Ask your child if they can remember any of it. What does Babble Gabble or Sentence Tennis mean? In Maths we continued work on place value and started to round numbers to the nearest 10 or 100. We had to spend a bit of time working out what the multiple of 10 would be before a given number and after that number. It was quite tricky! We're going on a Rock Hunt!